I write this latest update, surprisingly, whilst wearing clothes. Real clothes that are not pyjamas, or even trackies, but my standard ‘slob of a uni student’ gear of leggings and a massive jumper. This is unusual, as the laziest people, such as myself, do not need an excuse to spend their days in pyjamas, but I finally have one. Yet here I am, trying not to abuse it. I managed to cut up and remove the gross core-y parts from the apple myself. With a knife. Which is groundbreaking due to the fact that I’ve barely moved my right arm within the last six days due to a tender PICC line. Full story to follow. I am also unsupervised at the occasion of this apple eating, which is glorious because my parents, having read every cancer manual and leaflet the hospital have given us, and probably about double that amount online, have become so entranced by the drop in my neutrophil levels that they will no longer let me eat anything even vaguely resembling an apple without peeling it first, just to avoid any risk of infection. So I apologise to them now for my inevitable stomach infection to follow. 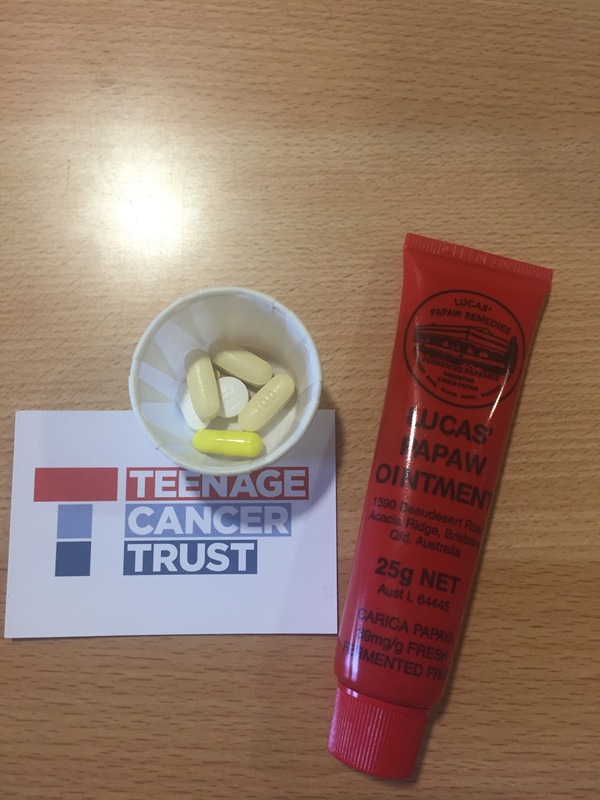 When I started this blog post a couple of days ago, I was mentally planning an enthusiastic tirade of joy about how mild my chemotherapy experience has been so far. But alas, that is now not so much the case. As generally ok as I am, I have been warned, repeatedly, that the worst is yet to come, and that I should count my blessings. So far, I’ve been pretty lucky when it comes to side effects. Even in the last forty-eight hours that I’ve been planning this post, my side effects have gone from nothing, to fairly irritating. 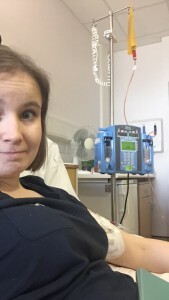 I don’t know about anyone else, but judging by what little I’d heard of people’s experience of chemo, or from what I’d seen in the sad films, I expected to be hooked up to one drip bag of chemo for days on end, and instantly start projectile vomiting, shunning all food, and tearing out fistfuls of my hair within the first hour. Luckily, this has not been the case. My side effects do, however, include painful and distracting rashes and dry skin all over my legs and back, some fairly hideous burst blood vessels all around the lines where I wear clothes, an eye infection, an intermittent fever, and sore gums, which makes biscuit eating and toothbrushing quite hard. Whilst I do now prefer soup simply for the convenience, I am still enjoying a range of food (that which my mother brings in for me, anyway, regrettably I can’t say the same for hospital food), and enjoying it whilst it lasts. Other than that, chemo has so far been, and I hate to say it, anticlimactic. I am obviously not saying this because I wish for more severe side effects, or because everyone is lucky enough to have similar experiences to me. They’re not. This is simply a perk of being young, and having a good history of health, I guess. Like I said, I’ve got a long road ahead, but I’m appreciating what little I’ve got whilst I’ve got it. As far as the technicalities of chemo go, that is what I would say is the biggest surprise. I’ve heard horror stories about being on a drip for hours at a time, taking the drip stand into the toilet, being disconnected only to shower, and chemo cycles that run for over thirty hours at a time. Again, I’ve been very lucky. I’ve had two different chemo drugs, one which only runs for an hour for three days, and which I’ve now finished (the only exciting thing about that was the fact that it turns your wee orange, soz to all the squeamish people reading this, but what are chemo stories without oversharing, am I right? ), and another drug which is just an injection into my arm, twice a day, twelve hours apart, and takes about twenty minutes. Easy. Obviously I haven’t been completely free from the shackles of my beloved drip stand. When I started chemo over a week ago, I was hooked up to huge bags of IV fluids, which helped my kidneys to flush out all the poison residue in my body, and they ran for over thirty hours without stopping. It felt like I was on them for a lifetime, but, thankfully, I was disconnected twelve hours early because all the fluid had made my already prominent cankles (to the previous generation: that’s us kids’ fear that our calves and ankles will be of the same thickness), swell up even more. There were a good couple of inches of fluid-fat lurking down there, and the fingers on one hand, bizarrely, had become too sausage-y to competently hold my phone. Modern-day disaster. Turns out my kidneys were fine, but after putting on over two kilos in less than twenty four hours, the doctors concluded that enough was enough (something that I and all my personal medical professionalism had decided about twenty seven hours prior, when I was desperate for a shower). Other than that, I’ve had three units of blood and two bags of platelets, which don’t take too long, but the main skill I’ve acquired from these experiences is to sleep through the chugging away of a drip, which is not an overrated skill in hospital, I can tell you. So, that’s pretty much it for my chemo. I actually finish tonight, which is exciting, even though I’m still on thrice-daily antibiotics for this fever. The next two-to-four weeks that I’m in here for is purely to monitor me for all the expected joys I have to come, such as vomiting, some, ahem, stomach troubles, infections, and low blood levels, which they can obviously keep on top of properly if I’m here. Moving on, I’ve told this story in a pretty backwards fashion, but I thought that people may well be waiting with bated breath (sort of….) for my dramatic chemo and hot-doctor stories. For now, I’m inconveniently lacking on both, I’m afraid. Ask me again in a week. I’ve been in here for less than two weeks, and have become well accustomed to my gleaming single room at the Hilton Churchill. But if we backtrack to last week, when I was preparing to come in on Monday, part of the plan was to not let myself come in with too-long hair. It’s a logistical nightmare anyway. I liked my hair, but hated faffing around washing and combing the knots out every day. As my hair started thinning, it would only become more of a problem to keep track of. So I went for the chop. I wasn’t particularly fussed about getting a stylish, razor-style bob, as much as I like them. 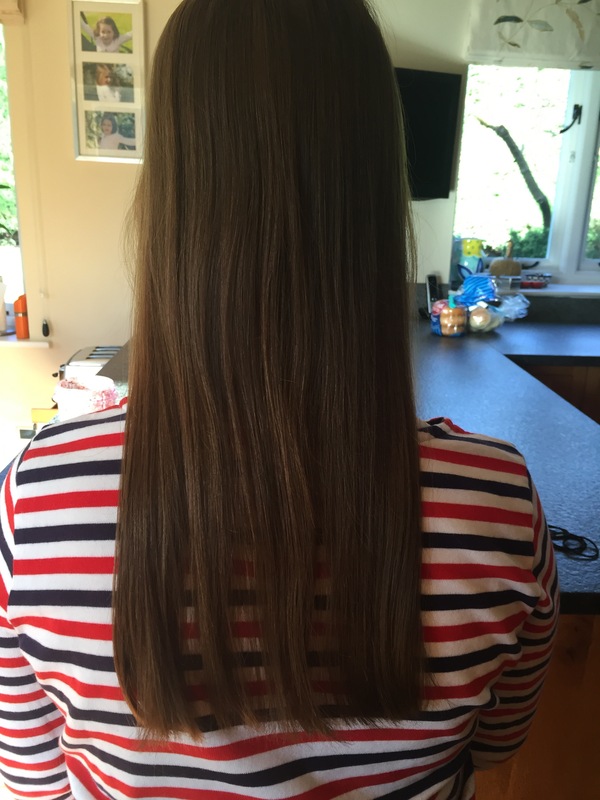 Realistically, I just wanted a no-frills cut, because my priority was getting enough of my hair as possible salvaged for the Little Princess Trust. 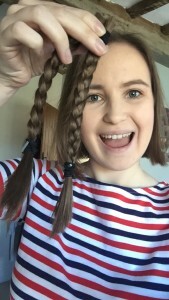 Their Facebook page is here if you’re interested in learning more, but they’re a brilliant charity who make wigs for little girls suffering with cancer. 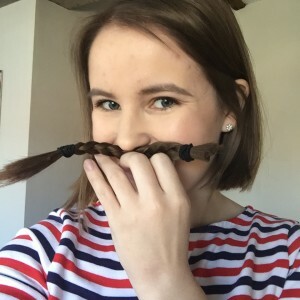 Real hair, as I’m sure you can imagine, makes a far nicer, less itchy, and more realistic looking wig than the synthetic kinds you can buy, so if anyone is making the brave move to cut off seven inches or more of their own hair, here’s a great place to send it. Another really worthwhile cause. 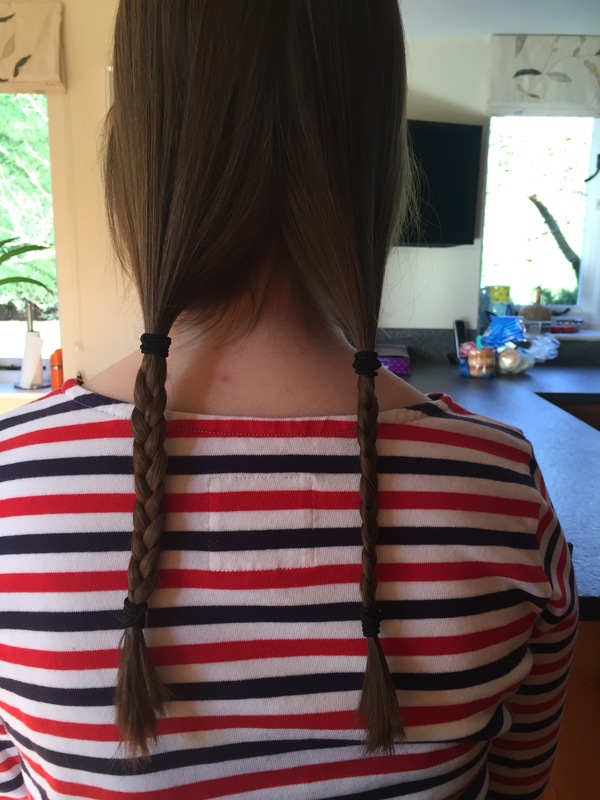 My mum plaited my hair, my hairdresser simply snipped the two plaits off, evened my hair up, and I posted it off to the charity. I reckon that if I thought about it too much, I’d miss my long hair. But having hair that I can wash one-handed is a blessing. I escaped for a walk around the hospital grounds the other day, and the wind blew my hair around my face in a fashion that made me mournfully remember my previous style. But then it all got caught in my lip balm, and I remembered again how high maintenance long hair can be. 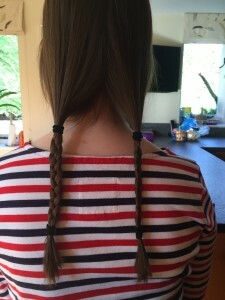 I’m being annoyingly practical about this whole thing, to be honest, and knowing that I won’t have any of the soft stuff on my head for much longer means that I don’t really have a whole lot of time to spend loathing the change. And now, we address the second part of this title, and if you’re too squeamish, I suggest that now is the time to scroll past and rejoin us at the conclusion of this post. And who would blame you? My word count is already getting out of hand. Remember that, due to the quietness of the last ten days, in comparison to what I was expecting, anyway, I have a lot of time on my hands, so I’m making the most of writing whilst I feel up to it. Anyway, the PICC line. PICC stands for Peripherally Inserted Central Catheter, which basically means a long needle-ish line that runs from the outside of your right arm, into a big vein on the right side of your heart. There, any drugs that are injected into the tube in your arm will be pumped and distributed faster and more effectively around your bloodstream. It’s a godsend, once you’re used to it. Blood cancer doctors are big on daily blood samples, unsurprisingly. So my arm now carries a tube which you can unscrew, and take blood from without having to stab me with needles twice a day, and another line for all the poisonous, but lifesaving, drugs that go in. Any antibiotics, transfusions, or chemo that I need is simply pushed by a drip and a syringe into my arm. The process is completely painless, but I don’t like to watch, as I am a little squeamish, and the bruising and dried blood around the place where the line was inserted is enough to make me cringe. The process of having it put in was, arguably, the most surprising part of it all. I’ve read horror stories about the pain of having it inserted, if a good vein can’t be found. I know how important lines are, how much easier they make the lives of the nurses and the patient, I knew I’d be fine when it was in, but by the time the specialist nurse turned up to insert it early on Tuesday morning, just hours before my chemo was due to start, I’d worked myself up into a complete state. I was sweating, my heart rate was through the roof, and I was completely alone with no one to hold my hand. After some polite conversation while she set up all her scary-looking kit, I apologised for my appearing rude, and just put my headphones in and turned my head as far away as I could from my right arm. I’d heard the whole process could last about twenty five minutes, and was sweating at the thought, but overall, it took about ten. The nurse had no problem finding a good vein around my bicep, and the only uncomfortable part was the local anaesthetic injections into my arm. She had to cut through the muscle and do a bit of poking around, but all I could feel was some tugging, and before I knew it, I was shocked to hear that it was over. She just used an ultrasound machine to thread the wire through the same vein until it was sitting comfortably. After that, all I needed was some plasters, and a chest X Ray to check that everything was in place. Another nurse came in to tweak it slightly, and then it was good to go. I’ve struggled with the PICC since then, I will admit. Cutting through the muscle proved to be the most difficult thing to adjust to, and for days on end I slept on my back, arm stiffly at my side. Moving it around was painful, and I started brushing my teeth, hair, everything, with my left hand. I’m finally getting better, I can bend it around almost as normal, and typing feels revolutionary. The eventual aim is for me to not be able to notice it at all, but, ladies, just take a moment to imagine how difficult it is to put a bra on or take earrings out with one hand. I’ve really taken my right arm for granted, put it that way. Obviously though, it gets a little better every day, and I can’t argue that it’s done the job. Chemo goes in, blood comes out, like clockwork, which is infinitely preferable to my constant twitchiness whenever someone brings a cannula kit out. All in all, a bizarre ten days. If only because they’ve been far more simple than expected. My doctors are pleased with my progress, and although we won’t get a good idea of what’s going on for another few weeks, when I’ll have another biopsy, my body is coping with chemo thus far, and the lack of nausea is a definite perk of being young and strong(ish). I’m lucky that I’ve been doing so well, and I’m hoping to keep it up. I’m now, however, officially neutropenic, which means I have pretty much no cells to fight off infection, so, although my family have kept me entertained by popping in and out, I need to start being a bit more wary and take my doctors seriously. Neutropenic sepsis, from what little I’ve heard, is no joke. So that’s it. I’m sorry this has been so long and ramble-y, but that’s a bit how my head feels right now. It’s funny how much a different environment can unsettle you. Three final things; I learnt from my consultant today that the average person carries three kilograms of bacteria on them at any given time. Delish. Secondly, today is my boyfriend, Matt’s, birthday. I hate to end a post on such an up-close-and-personal moment that may not interest you, but, at risk of sounding too much like a Mum instead of a girlfriend, I really appreciate Matt and everything he’s done, and want to wish him a good birthday in as many ways as possible. If you know Matt at all, go and make a fuss of him, won’t you? I wish I was around to do it. It’s not easy having a girlfriend prone to raging hormones and moodswings as it is, let alone one who now has cancer, too, so someone that can put up with me deserves a good birthday. Finally, at risk of sounding too much like Adele accepting her fourth consecutive Brit award, thank you so much to everyone who supported me when I wrote my last post. Every Facebook message, like, text, or comment reassuring me that my haircut wasn’t too horrible, or telling me they were sorry or that they liked my blog, was a massive confidence boost for me. So, thanks. This is certainly a good time to learn about how kind people out there really are. Also, at risk of sounding too old, a reminder of the power of social media. So, for now, all I can do is keep my fingers crossed that I’m doing well when I next get round to posting, whilst still managing to keep you lot entertained. Wish me luck! 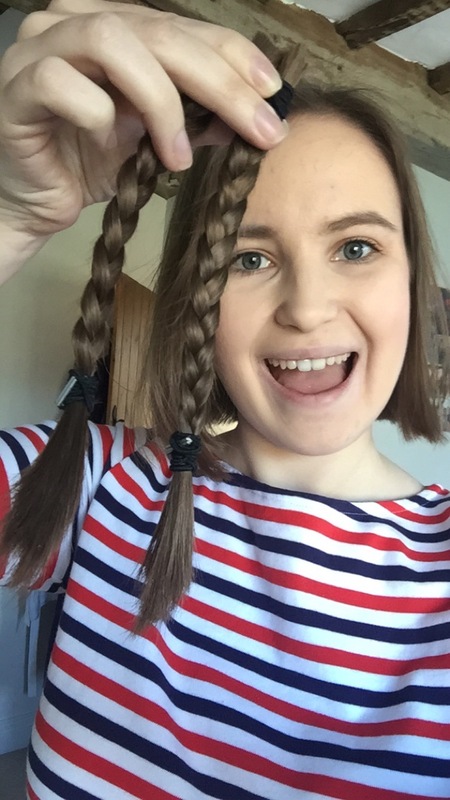 What an amazing, inspirational, funny and caring young woman you are. A privilege to read about your journey. Love and strength. Wow Alice – you have to write a blog book when you beat this nasty cancer – your writing is so good and I feel like I’m experiencing everything with you. Keep strong, keep fighting and keep writing. Wow I feel totally exhausted for you having just read all about this new stage in your journey! My mother had to endure this treatment many moons ago, and had had the all clear for at least 5 years now. On a completely different note, and not to make you jealous, but I have just had a cup of tea and tucked into to one of the infamous ‘Byron’ buns mnnnn yummy. Haha, thank you Rus, I wish your mum the best anyway. Very jealous of the buns, I’ve given chocolate up for lent but luckily not cake in general so the buns are not off limits, just need to sneak one in here! I am nothing more than a friend of a friend who found your blog via facebook. A middle aged professional curmudgeon in genuine awe of your strength. I write a little when the mood takes me, but never when pressured – that you can write so well in present circumstances is remarkable and I thank you for sharing your story. I do know from personal experience that strength and attitude towards even devastating illness makes one heck of a difference and am certain that yours will be a positive influence. Like the earlier comment, I too wish you the smoothest, speediest journey to the best possible outcome. Thank you Paul, very kind of you to read and comment, says a lot about the power of Facebook! Having watched a lot of Grey’s Anatomy I feel you’re probably best with the non-hot docs. The hot doctors are all up to shenanigans in on call rooms and I get concerned as to their standards of care.